Director Paul Feig continues to tease us with images of iconic Ghostbusters items, updated for the his new film. 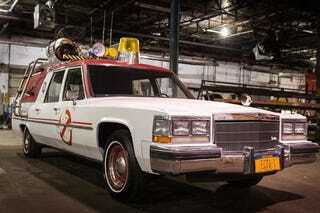 The latest is Ecto-1, which Feig tweeted with “#whattheygonnadrive.” It looks pretty great! This one is more recognizably a hearse than the original — fewer windows and doors — and with less of a round look. Plus, you know, a giant light on top. In keeping with everything else we’ve seen from this production, it’s true to the “cobbled together at home” aesthetic.